What are the benefits of taking a Digital Marketing Course? What is the Mimic Pro simulation included in the course? What is the Mimic social simulation included in the course? What is the average salary package for certified Digital Marketing professionals? 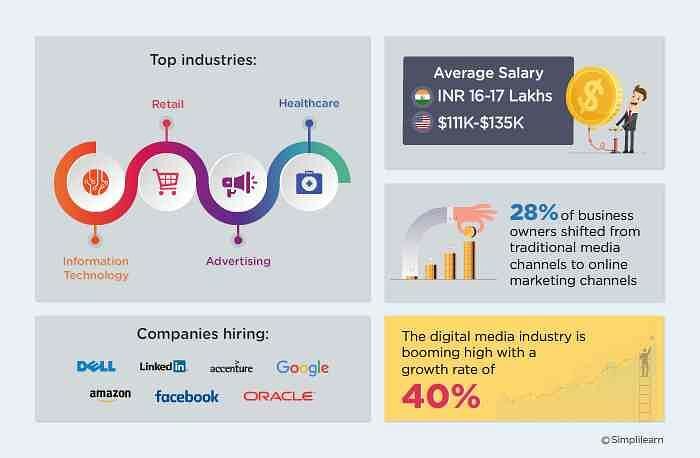 A Digital Marketing professional can earn around $111,000 - $135,000 in the US, and 16-17 lakhs in India. What is the Hootsuite Platform Training course? We partnered with the Hootsuite Academy team to include the Hootsuite Platform Training course as part of the Simpliearn Digital Marketing Course. In this module, you’ll develop the skills to use core Hootsuite products to their full potential, boosting the impact of your social media efforts, driving results, and proving your ROI. Successfully complete the first three rounds in Mimic Pro, which will be evaluated by the lead trainer. Once you’ve completed the DMCA course, you will have to pay and schedule your online OMCA examination. To earn this industry certification, you'll need a passing score on the exam, proof of education and experience. The certification is valid for two years when renewed with professional development units. How will I earn the Hootsuite Platform Certification? Once you've completed the Hootsuite Platform Training, you'll be ready to take the exam on the Hootsuite Academy website to become a Hootsuite Certified Professional. As a Simplilearn student, you'll get 50% off on this industry-recognized credential! Get certified for 50% off. Simplilearn digital marketing courses are created by the industry experts. 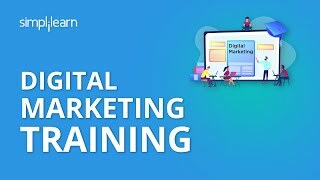 These comprehensive courses provide solid foundational learning for all aspects of digital marketing and shape a candidate for a career in the industry. I would consider Simplilearn alumni for our digital marketing needs. I recommend Simplilearn for anyone who wants to get a strong foundation in digital marketing. Simplilearn's program gets the learner hands-on and job ready with case studies as well as live projects, across different marketing channels. 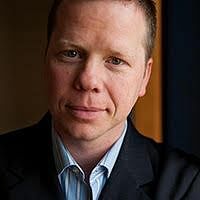 Brad Geddes is the author of Advanced Google AdWords and the founder of Certified Knowledge. 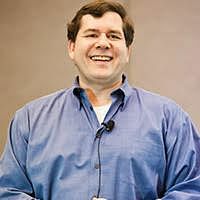 He frequently writes columns for Search Engine Land and co-moderates the Google Ads forum on Webmaster World. He has led more than 60 AdWords seminars. 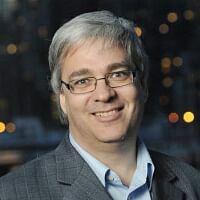 Stéphane Hamel is a Google Product Strategy Expert and is named the Most Influential Industry Contributor by the Digital Analytics Association. He has made significant contributions to the industry, including creating the Digital Analytics Maturity Model. Simplilearn provided excellent training to help jumpstart my knowledge with their Digital Marketing Certified Associate course. Definitely learned a lot. Thank you Simplilearn. I loved Simplilearn's course! With my new, upgraded digital marketing skill-set, I now direct and lead our company's sales and marketing efforts. The skills gained from the certification helped me to optimize my clients' website and measure the outcome of my decisions on a website. I was really impressed with the content and the knowledge of the presenter. Looking forward to learning and moving forward onto the rest of the course and the projects. Thank you. DMCA master course is great, highly recommended! My career counselor was very patient and above all, very professional! Thanks once again! Great team guys! Congrats! Simplilearn has knowledgeable and great leaders! Thanks a lot for your support as well! The course is so creative, I enjoyed it... It's like learning a new language. Although I had some knowledge with regards to how a digital media campaign is created, the training has opened my eyes to the possibility that one can build a brand through digital marketing. The creative process is very interesting. The training is very easy to understand and follow. Content and LMS are excellent and the trainer is very knowledgable. I love this course. The training is really targeted and spot-on...and I can apply the learnings to my job right away! The training offers practical tools and techniques in addition to the high-level view. I really like it. After successful completion of the training, you will be awarded the course completion certificate. OMCP is an industry-wide accepted certification standard, and many experienced marketing professionals pursue this certification to build on their existing skill set. To get this certification, participants need to show 5000 hours of experience in Digital/Online Marketing or a post-secondary degree plus 2000 hours of experience. Participants must also register with OMCP and pass the certification exam. OMCA is an entry level certification for online marketing associates and practitioners who are planning to build their career in digital marketing. This certification is perfect for managers and associates who are starting their journey in digital marketing, and it can be regarded as the first step towards the OMCP (advanced level) certificate. This certification is designed to prove conceptual knowledge of digital marketing foundational concepts and accepted practices across multiple digital marketing disciplines. Who awards OMCA and OMCP certification? OMCP accredits training providers from a budding list of industry’s best known educational institutes and awards PDUs for participation in the industry’s top events in various capacities. Only those institutes whose course meets strict quality standards are accredited by OMCP. How many institutions teach OMCP standards and who are they? If in case you miss any class don’t worry, all the live courses are recorded and available for you to access. So, if you miss any class, you can go back and watch the video to clear your doubts. What are the other benefits apart from the job? You will gain in-depth knowledge of SEO, Social media marketing, PPC, digital analytics, content marketing, email marketing, web analytics, marketing automation, website conversion rate optimization, and digital marketing strategy. You will have real-life experience of how to formulate, plan, and execute digital marketing strategies. Also, you will be prepared for various digital marketing certification exams, like OMCA, Google Analytics, Facebook Blueprint, Google Ads, and YouTube Marketing.